I've been teaching in the Iban motherland for more than 1 year now & I have tasted many exotic fruits exclusively available only within these quiet secluded timber forests. Now, don't you smirk at me! You perverted baskets I call friends are thinking about a different 'fruit'! There are no innuendos here. The exotic fruits that I'm talking about are REAL fruits. Buah Isu resembles it's cousin, the Durian, but I was told that it is NOT in the Durian family. The spikes are longer & they are sharper. They are also very much smaller than the Durians. It's about the size of a man's palm. It has a pleasantly sweet fragrance which is not pungent like the Durian's. Because of it's size, it is easily opened with a cleaver. After opening my first Isu, I couldn't help but bounce off the walls in gay laughter. It was all too amusing to me! It's cute little fruitlettes are orange in colour! And they come in adorably small sizes! 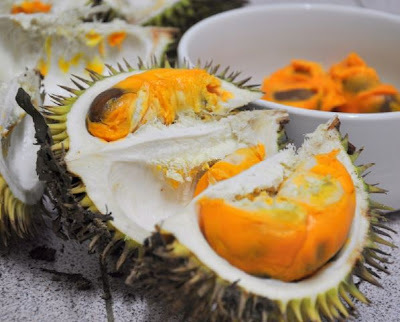 If I were to export Durians to Japan, I'd end up bankrupt. But if I were to export these Isu fruits & pass them off as mini-Durians, I would make millions capitalising on their obsession of all things small & cute! hoho~~ the Chinaman in me speaks! Well, the flesh is orange in colour with dark earth brown coloured seeds. The flesh is thin & it has a peculiar taste. It definitely doesn't taste like a Durian. It tastes sweet like a blend between the Cempedak fruit & the bubblegum candy flavour. It is like nothing you've ever tasted before! I like it but, like the Durian, it is not something that I'd be fond of eating every day. When you are in Sarawak, esp in the Kapit or Sibu region, look out for Buah Isu in the Iban markets. They cost only RM5 for a cluster of 5-6 in Song but I expect it to cost a lot more once it gets to more urban areas. I'll be bringing some back to Kuching as a CNY treat for my family. 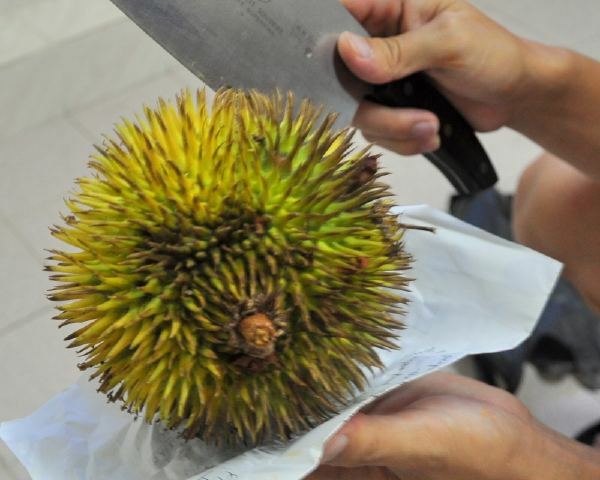 Note (30/11/2012): An anonymous commenter of Borneoan origins said that this fruit is actually 'Buah Nyekak'. I'm sticking to 'Buah Isu' because I got it from Ibans in Song, Sarawak, & shared it with other Ibans in the area. They called the fruit 'Buah Isu'.